Vishay Intertechnology has broadened its optoelectronics portfolio with the introduction of new high-speed photo detectors in miniature gullwing, reverse gullwing, and side-view packages with wide-view dome lenses. Offered with or without daylight blocking filters, featuring a ± 35° angle of half sensitivity, and AEC-Q101-qualified, the VEMD2xx3(SL) PIN photodiodes have a typical output current of 10 µA and an extremely low dark current of 1 nA while the VEMT2xx3(SL) phototransistors have a typical output current of 2.7 mA. For applications requiring emitter-detector pairs, these new photo detectors have matching emitters in Vishay's high-speed ± 25° and ± 28° VSMB2943xX01 series. The photo detectors released today will be used as photo interrupters, detectors for optical switches, counters, encoders, position sensors, and for IR remote control and data transmission in automotive applications, infrared touch panels, light curtains and barriers, and metering systems. Offering black dome lenses and spectral bandwidth ranging from 750 nm to 1050 nm, devices with daylight blocking filters are responsive to infrared light, while suppressing ambient light to increase the signal-to-noise ratio. Clear epoxy devices without daylight blocking filters offer a broader wavelength range of 350 nm to 1120 nm and are sensitive to visible and near infrared radiation. The photodiodes and phototransistors offer operating and storage temperature ranges from - 40 °C to + 100 °C. With a moisture sensitivity level (MSL) of 2a, per J-STD-020, the VEMD2xx3(SL) and VEMT2xx3(SL) series provide a floor life of four weeks. Compatible with lead (Pb)-free reflow soldering, the devices are RoHS-compliant, halogen-free, and conform to Vishay "Green" standards. 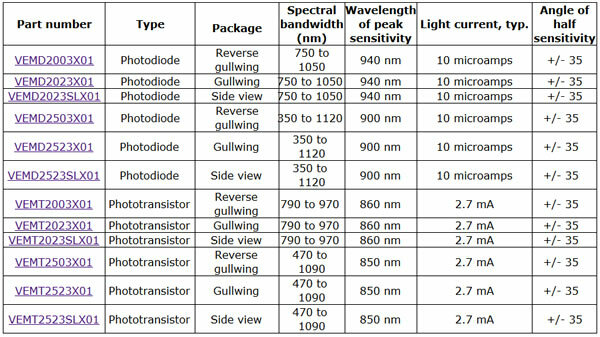 All datasheets are available for download from the table here.